Dental retainers are often worn after braces are removed. The retainer will keep your teeth in its new place, preventing them from returning to their previous position. 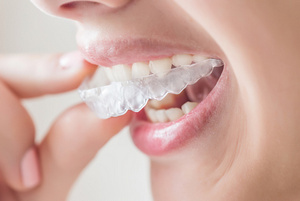 Therefore, it is incredibly important that you wear your retainer as instructed by your orthodontist, and proper oral hygiene is important during this time. Your general oral health regimen will be the same when you start wearing a retainer. You’ll still need to brush twice a day, floss daily, and use mouthwash to keep your teeth clean. You’ll also need regular appointments with your dentist. Only a dental cleaning will remove the hard tartar that accumulates on your teeth with time. Now that you have a retainer, you need to be concerned with brushing more than just your teeth. You’ll also need to brush your retainer twice per day, but don’t use toothpaste. For daily cleaning, just use water. However, at least once a day you should disinfect the device by soaking it into a denture cleaner, such as Polident or Efferdent. Simply add the cleanser into a cup of warm water and take care to rinse it off before you put it back into your mouth. If you prefer natural solutions to clean your retainer, you have a few other options. Baking soda is a safe disinfectant, controlling bacteria without some of the harsh chemicals found in other cleaners. White vinegar can also help to remove residues and odors. However, vinegar has a strong smell, so people who choose this option for cleaning may prefer to do so outdoors in order to avoid fumes. Failure to properly clean your retainer can expose your mouth to many bacteria. If you need to learn more about cleaning your retainer or caring for your teeth, please call our office. We are here to help.